•	In the United States, honey production from producers with five or more colonies totaled 178 million pounds in 2014, up 19 percent from 2013. •	There were 2.74 million colonies producing honey in 2014, up 4 percent from 2013. •	Yield per colony averaged 65.1 pounds, up 15 percent from the 56.6 pounds in 2013. •	Honey prices increased to a record high during 2014 to 216.1 cents per pound, up 1 percent from 214.1 cents per pound in 2013. •	Honey bees are essential to the production of more than 130 crops in the U.S., adding more than $15 billion in value each year. Locally produced honey is flying off the shelves – so much so that many honey producers cannot meet the production demands. Fifteen years ago, Arp’s Mountain Top Honey Co. in Flagstaff produced 126,000 pounds of honey a year. Now the farm only produces 70,000 pounds, he said. The farm has several hundred more hives than it did 15 years ago, but with fewer foraging options for nectar, wet winter weather conditions and unhealthy hives, the bees don’t produce as much honey. Nationally, beekeepers did better last year. According to the U.S. Department of Agriculture, honey production was up 19 percent compared to 2013, totaling 178 million pounds of honey from keepers with five or more hives. But local experts said Arizona hasn’t necessarily followed that trend, which can hurt consumers. People with seasonal allergies have struggled this season as pollen floats freely through the air. 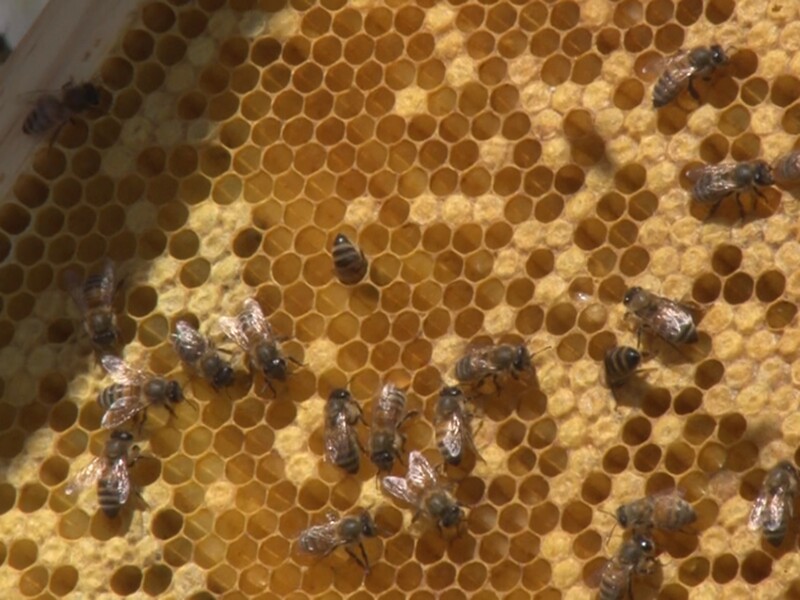 Some consumers look to local honey as a natural remedy. Customer demand is so high now, Arp has relied on buying honey from other beekeeper friends to sell to his customers. Arp said retail prices range from $20 for a quart to $80 for a gallon. Arp said he estimates the state has 30 to 35 commercial beekeepers. Though some bee farmers are doing brisk business, they have had to change the way they operate. Many beekeepers loan out their bees to make up for less honey production. 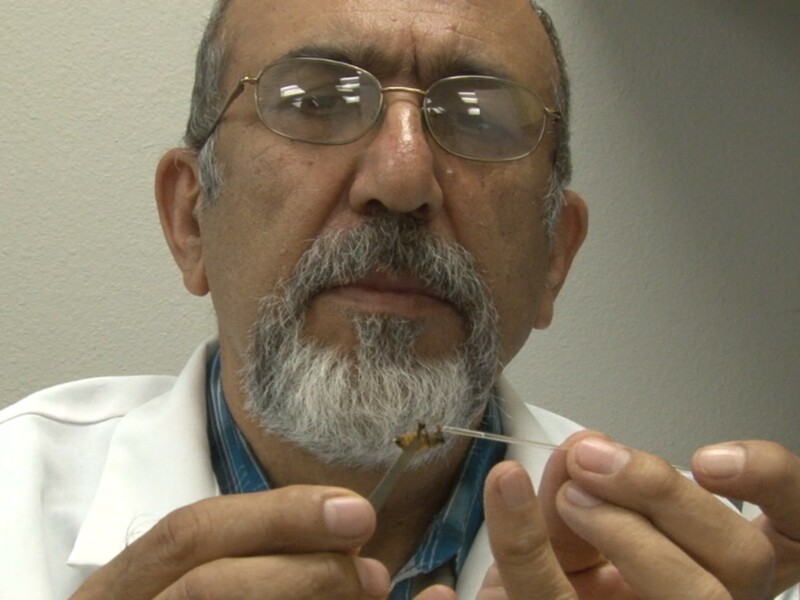 Osman Kaftanoglu, project manager of the Honey Bee Research Lab at Arizona State University, said many beekeepers transport bees to almond orchards in California to make extra money. Arp said he easily makes $150 every time he sends one hive to cross pollinate almond trees. Transporting eight hives turns into $1,200. Nearly half of Arp’s income comes from almond tree pollination, he said. “The almond industry is keeping the bee industry alive,” Arp said. Beekeepers face major challenges in keeping beehives healthy and productive. It’s difficult to find the right location to raise bees. Orange groves, where bees depend on orange blossoms, are either dying of disease or being replaced by urban development, according to the city of Mesa. In 1970, the state produced steady amounts of citrus across 80,000 acres, but as of 2012, the state grows just over 17,000 acres of citrus, according to the U.S. Department of Agriculture. Tim Moore, owner and beekeeper of Honey Hive Farms in Peoria, said he only keeps his hives on organic farms because there aren’t any pesticides that could harm the bees. Farms do more than just use pesticides. Killing weeds that grow along farmland hurts bees that depend on the nectar-bearing plants like milkweed, Arp said. 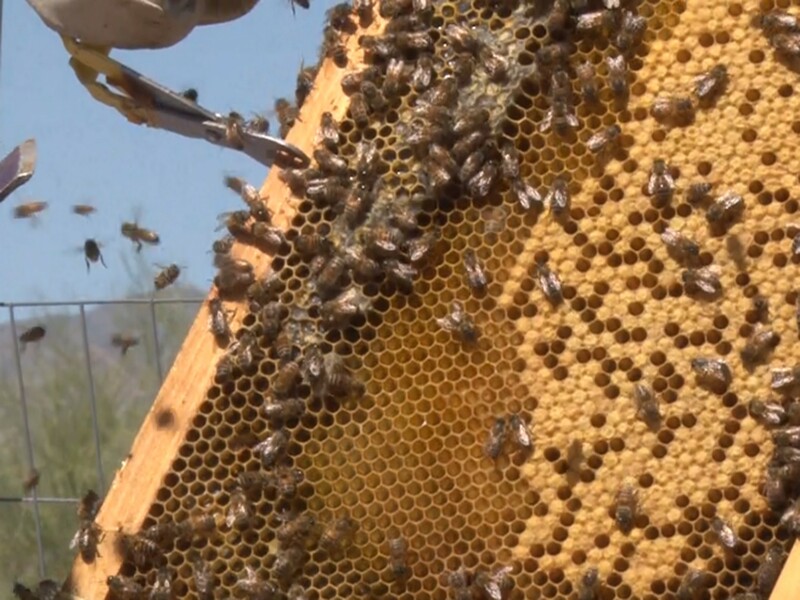 One of the farms Moore uses is Blue Sky Organic Farms in Litchfield Park, where he keeps his hives in a secluded area. On a recent day, he examined a group of about 10 hives, checking on the honey combs for signs of trouble. The noise from leaf blowers and tractors competed with the buzz from the bees. Moore said if the noise became too loud, the bees would get “agitated” and could swarm. Arp said that relationship between bees and humans ¬¬– making sure people are safe – is another business concern. Ultimately, researchers and beekeepers said bee education is necessary for better bee business. Moore started the Phoenix Beekeepers Club, which offers beekeeping classes as well as beginner beekeeper support. While Honey Hive Farms has been successful, Moore said he wants to scale back from owning 400 hives to something more manageable. He said that having fewer hives allow him to take better care of the colonies. Beekeepers who stay on top of managing its queen bees and growing bee-friendly plants can make twice as much honey on half as many hives, Arp said. Locally produced honey is flying off the shelves – and producers are having trouble meeting demand. One beekeeper has resorted to buying from friends to try to keep up. 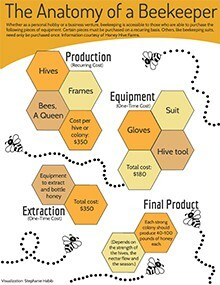 Honey bees from Honey Hive Farms work hard. Osman Kaftanoglu, manager of the honey bee research lab at Arizona State University, inspects a honey bee. Tim Moore, owner of Honey Hive Farms, checks hives for any signs of trouble at a Litchfield Park farm. Tim Moore, owner of Honey Hive Farms, tends to his bees at a farm in Litchfield Park.